You promised to end this slaughter. Why is US now leading the fight to legalize it? 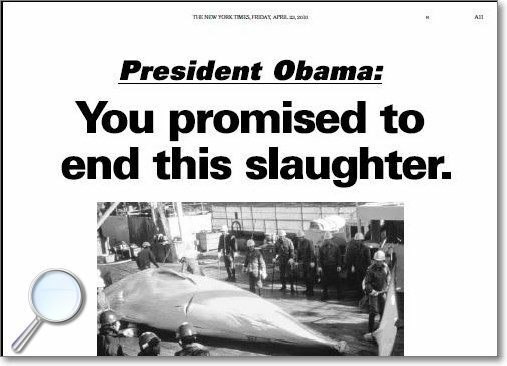 Instead, the New York Times front page (4/15/10) reports that your administration is now “leading an effort” within the International Whaling Commission to broker a deal allowing Japan, Norway and Iceland to legally resume commercial whaling despite a 24-year international ban. That is why environmental organizations and scientists worldwide object to this unseemly back-room deal. Legalizing commercial whaling won’t end it. 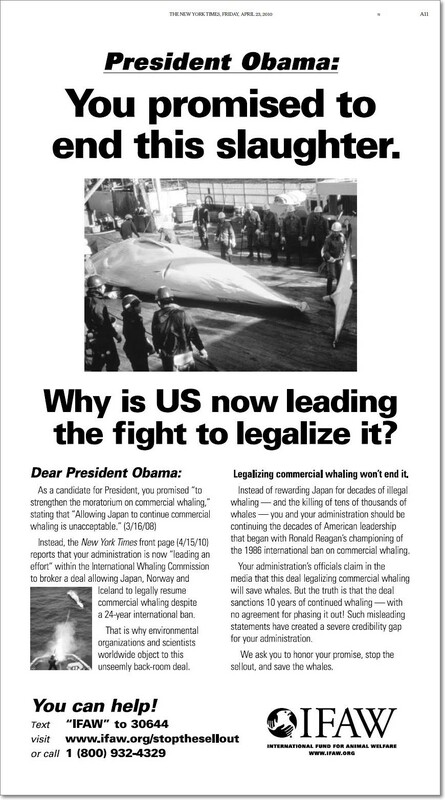 Instead of rewarding Japan for decades of illegal whaling — and the kiling of tens of thousands of whales — you and your administration should be continuing the decades of American leadership that began with Ronald Reagan’s championing of the 1986 international ban on commercial whaling. Your adminstration’s officials claim in the media that this deal legalizing commercial whaling will save whales. But the truth is that the deal sanctions 10 years of continued whaling — with no agreement for phasing it out! Such misleading statement have created a servere credibility gap for your administration. We ask you to honor your promise, stop the sellout, and save the whales.